Neither Sleet, Nor Snow, Nor Dead of Night………. ……..will keep us from finding the junk! Or in this case, vintage treasure! We left last Wednesday, heading South for our favorite estate sale on the Gulf Coast. Arriving right behind us was our first snow storm of the winter. As we left Southwest Missouri behind, we knew that it could possibly be a challenge on our return trip home on Friday, and considered not going………but the thrill of finding vintage treasure won out! We arrived on the Gulf Coast to a balmy 75-80 degrees and lots of humidity……..I had forgotten how much my naturally curly hair “loves humidity”! Everyone was still walking around in tee shirts and shorts! I lived in this area for 25 years and always missed cold weather during the Christmas season. For me, balmy weather doesn’t put me in the Christmas mode. I know, I’m a weirdo! We didn’t find as much at this estate sale as we have in the past, but we were still very pleased with our finds! While there, we kept an eye on the weather, getting updates and road conditions and soon realized that the return trip was going to be an interesting one. Hubby had to be at work the next day, so we really needed to get back. We got in line early on the first morning of the estate sale (6:30 a.m.) which was actually a little later than I like getting there……many people were already camped out. As soon as the doors opened at 8:00 a.m., we made a mad dash for things we could spy from across the room. Luckily we were able to nab most of what I wanted! And the furniture……….oh my gosh……the most amazing furniture to be had, at unbelievably good prices. I didn’t have room to bring much back in the way of furniture other than a sweet French side table and a lovely Italian gilt chair. Next time though, I’m seriously thinking a trailer might be in order! Can you sense hubby’s eye roll here?? Making fast work of it, we checked out and got everything loaded into the SUV and headed back to Southwest Missouri. We knew that once we hit Arkansas, it was going to be slow going, and unfortunately we were not wrong! A normal drive time for this trip is 10 hours, but this time it took us 13 hours to get back, driving in ice and snow, darkness, lots of wrecks and cars off the roads. Most of the time we couldn’t even tell where the lanes were, we just tried to stay between the ditches! Very grateful for all wheel drive! It was a very intense drive back and we were exhausted once we finally pulled into our snow packed driveway, 13 long hours later. I’m not sure I want to repeat the experience, and I am very grateful that hubby was driving. We have both agreed that the treasure hunting may have to wait next time if these circumstances repeat themselves! I actually love snow and winter, especially during Christmas, I just don’t enjoy having to travel in it! We found some great vintage goodies though and can’t wait to get them all cleaned up and listed in the shop! Come visit! I know the trip built your character – but, the things you managed to acquire were just perfect. I live in Jacksonville, FL now but you truly had the best of both worlds. The snow was beautiful, too. Thank you Carol! I love all of the seasons, so I am definitely enjoying the snowfall we are having. By the end of January I will be craving Spring! Lol! 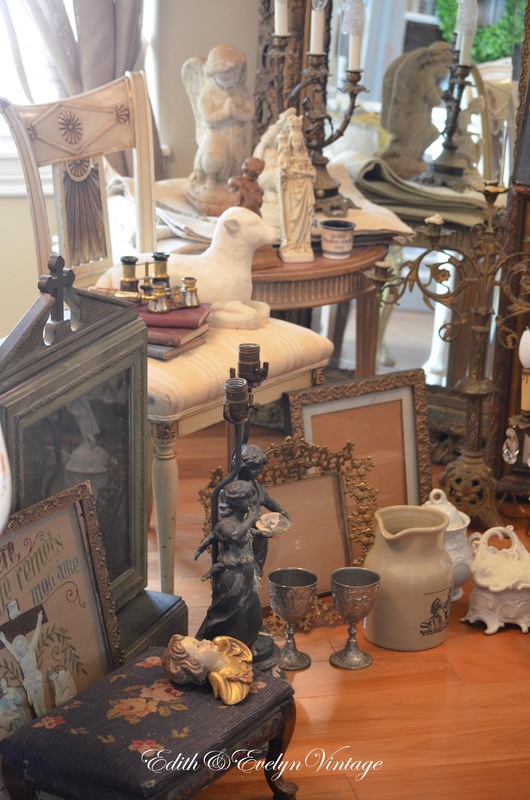 I spy…..some wonderful items. But oh my, that drive home would have done me in. We came back from visiting my son two Christmases ago in the same kind of weather….I was never so happy to get home…safe an sound. Oh Lynn, it was the worst! We were so grateful to get home. As much as I love “treasure hunting”, I don’t think I want to repeat these circumstances again! Don’t give up! Hubby only starting getting into it a few years ago and now he loves it almost as much as I do!